Case Study: Restaurant Schedule Management | Portland Payroll, Inc.
Portland Payroll helps restaurant transform schedule management, rein in costs, and maintain a loyal staff. Coat and Thai is a stylish Thai restaurant whose owners are planning to open a second location with hopes of franchising in the future. It deals with the complications common to the restaurant industry; service peaks, specialized staff, and high employee turnover. 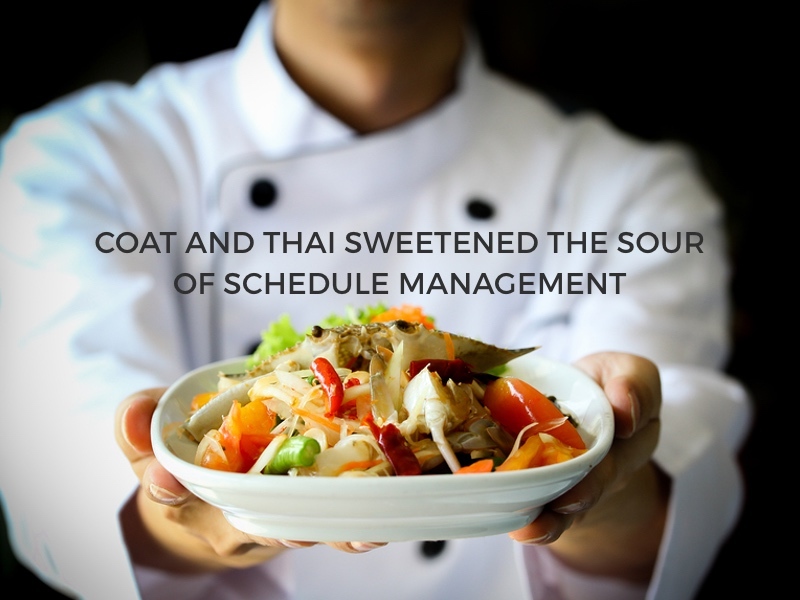 Coat and Thai’s single manager was the only one doing the hiring, scheduling, and time tracking, creating a bottleneck that soon became an overwhelming burden. She was managing employee time, attendance, and scheduling with a 90’s era punch clock, Excel spreadsheets, and a small dry erase board hung in the kitchen. The establishment has team members working from 5:00 a.m. until 2:00 a.m., seven days a week, compounding the logistics of scheduling. Additional challenges included maintaining adequate staffing for every shift, adapting schedules to sudden surges in business, managing schedule requests, tracking staff member meal breaks, and keeping skilled chefs and experienced servers from jumping ship to newer restaurants opening in the neighborhood; a sour prospect for any organization. Coat and Thai determined that the first order of business was automating employee time and attendance. TimeWorksPlus allows staff members to clock in/out from their mobile devices, eliminating the need to swamp the kitchen during critical shift changes, and allowing team members to move in and out of shifts with greater efficiency. 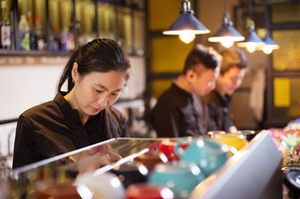 Guests are experiencing better service, and Coat and Thai has put an end to costly guesswork and back-dating when congestion forced employees to skip clocking in. Mobile clock also permits their head chef to clock in off site when purchasing produce at local farmer’s markets, saving time and reducing time card errors, something both management and employees appreciate. Coat and Thai has seen a decline in labor costs as a result of incorporating integrated clock in/out features for unpaid meal times and breaks. Before Swipeclock Workforce Management Suite, employees often punched out for a meal and forgot to punch back in, creating problematic back-filling and costly guesswork. With Swipeclock Workforce Management Suite PunchLogic, busy staff members are only given logical options when accessing the clock in system to lessen mistakes, assemble better records, and streamline payroll. Filling holes in the schedule has become much easier with the TimeSimplicity Virtual Trade Board. Previously, the supervisor would sling change requests to the staff, and then re-circulate when options were proposed. Now, staff members simply enter requests on the Virtual Trade Board. Managers can rapidly view, monitor and approve shift request changes online. Once a shift trade is confirmed, TimeSimplicity automatically alerts the appropriate associates. Since the system implementation, the restaurant has rarely been caught shorthanded. Job codes and pre-set requirements make scheduling easy so classifications such as the age requirement to serve alcohol don’t get missed during shift swaps or replacements. TimeSimplicity for simplified restaurant scheduling and mobile coordination. Mobile access delivers employee access and management control. The staff members love the Virtual Trade Board because it has significantly reduced the time it takes to manage work schedules and submit time cards. Many team members are college students whose schedules change each semester. Configuring schedules to better provide staff flexibility has considerably improved staff member morale and minimized turnover. The owners of Coat and Thai are better prepared for projected expansion into new venues and franchising. With a handle on the challenges of crew scheduling, and seamless integration with payroll, owners and management can now concentrate on service and growth. Custom templates make schedule replication quick and easy, and centralized reporting permits the organization to monitor and adjust to changes while minimizing expensive overtime, scheduling conflicts, and peak service emergencies. Most importantly; staff members are eager to participate in the growth of the business and share their enthusiasm with their increasingly satisfied patrons. Portland Payroll offers WorkforceHUB, the unified Human Resources portal that makes it easy to optimize the performance of your managers, employees, and company.